What Minimum Temperature Do Hens Need to Lay Eggs? Temperature can affect egg production in chickens. Cold weather, especially an extreme change, can cause hens to stop laying eggs. However, there are other factors that can cause your chickens to stop laying. Extremes of hot or cold temperatures can cause your chickens to stop laying eggs. Heat affects egg production in chickens more than cold. Chickens lay well when the ambient temperature is between 11 and 26 degrees Celsius, or about 52 to 79 degrees Fahrenheit. Below that temperature, egg production diminishes. However, hearty winter breeds are able to keep laying eggs as long as they have enough food and water. Once chickens begin laying eggs, they need 14 hours of light to continue laying. In the Northern Hemisphere after the summer solstice in June, the amount of light begins to decrease and continues to decrease until after the winter solstice in December. 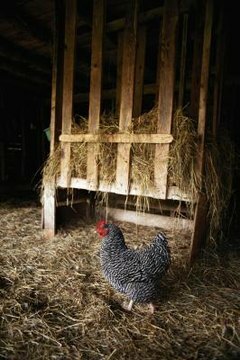 Often chicken owners think their hens stopped laying because of the colder temperatures rather than the lack of light. Chicken owners can remedy this by adding enough artificial light to make up for the lack of daylight. According to an expert at Mother Earth News, chickens can handle temperatures as low as -20 degrees Fahrenheit. That only works if your chickens are acclimated to those temperatures. Relative humidity of 75 percent or more will decrease egg production as well. If you live in a high humidity state or country, your chickens likely are more miserable at warmer temperatures than -20 degrees. Regardless, if you expect a sudden cold snap, consider providing some heat in the form of heat lamps or heat mats. Chickens breeds such as Plymouth rocks, chanteclers, Ameraucanas, Australorps and Buckeyes are known for being capable of handling extremely cold temperatures. Birds with large combs and lighter bodies generally are not suited for cold weather as their combs are susceptible to frostbite and their bodies are unable to maintain warmth.